Video clip synopsis – Surfie Shane is at Yallingup beach in Western Australia where he lives. Shane was one of the babies adopted through the ‘Operation Babylift’ airlift from Saigon, Vietnam, in 1975. Broadband MP4 saigon_bb.mp4 (4.9MB), suitable for iPods and computer downloads. This film clip shows Shane in his home, preparing squid for a barbecue. He talks about how he grew up in a family of seven and how his older brother protected him at school from bullying. He reflects on being brought up with a ‘help each other out’ family philosophy. We see archival family photos of Shane growing up. Shane’s Australian mother, Frea, talks about how the family tackled anti-Asian graffiti and posters in Perth in the 1970s and 1980s. Shane recalls this well and laughs affectionately about Frea’s proactive methods to “stand up” for her children. 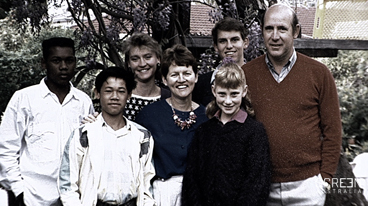 From Saigon to Perth – a Vietnam War orphan is an excerpt from the documentary Operation Babylift produced in 2003. A Film Australia National Interest Program. Produced in association with SBS Independent. The narrator tells us that “Not all adoptees from the Babylift want to explore their past. Shane is content.” How does Shane explain his position to the viewer and how does he describe this in Australian vernacular? Shane thinks it would be pointless to search for biological family in Vietnam, but he is interested in visiting Vietnam. What are his reasons? The footage of Shane surfing at his local beach at Yallingup, Western Australia, suggests part of the reason for his contentment. Identify what brings Shane contentment? What are the commonalities and differences with the babylift operation from Vietnam and Australia’s Stolen Generation? Shane says that to find his biological family would be “Awesome” but then reflects “But what do you do when you find them?” What issues might Shane be anticipating? The last image of the wave rolling in may be intended as a metaphor by Dai Le, the filmmaker and director. What might the wave symbolise about Shane?